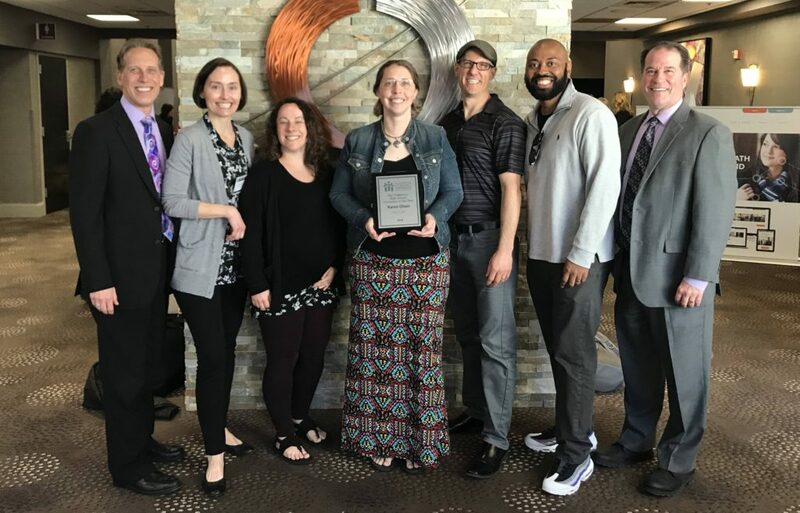 Collinsville High School Counselor Karen Olsen was named 2019 Ray Piagentini High School Counselor of the Year by the Illinois School Counselor Association during their annual conference in Bloomington, Illinois on April 12, 2019. The award is presented annually to a high school counselor who “possess the personal qualities thought to be desirable in an exceptional counselor.” The recipient “must have been responsible for innovations in the counseling program, for providing leadership in the further development of existing services, for demonstrating leadership in professional counseling associations and for performing an outstanding service to the school or community.” Olsen was nominated by fellow CHS Counselor TaRael Kee. Ms. Olsen is graduate of the University of Illinois with a BS in Psychology and a Masters in Social Work. She holds certification in school counseling from Eastern Illinois University. Karen Olsen joined the staff at Collinsville High School in 2008 and currently serves as department co-chair. Her outstanding service to CHS students and fellow staff members is legendary. She is co-chair of the Student Recognition Committee, serves on the Illinois Democracy School, RTI (Response to Intervention) and School Improvement Committees. She is a Counselor Mentor and member of the CUSD 10 “HART” Emergency Response Team that assists students and staff following a traumatic incident. She received the CUSD 10 Superintendent’s Award in 2014 and a Peabody Leader in Education Award in 2012-13. Olsen instituted the annual “Academic Signing Day” tradition at Collinsville High School. CHS Academic Signing Day honors seniors as they accept academic college scholarships from their chosen universities. Parents and college representatives join the students as they ceremoniously sign letters of commitment – in the same way athletes commit to schools. Ms. Karen Olsen is an exemplary school counselor, educator, and leader at Collinsville High School. It has been my pleasure to collaborate with Ms. Olsen the past five years in my role as principal. She is an outstanding and compassionate educator. Karen has been instrumental in numerous progressive academic initiatives at Collinsville High School, such as Academic Signing Day. She coordinates our Advanced Placement Program and regularly meets with students in order to collaborate in the development of post-secondary plans. Ms. Olsen also participates in our Student Support Team meetings and formulates at-risk lists in order to better serve students in need of academic and social interventions. She regularly collaborates with our social workers to provide students emotional and social support. 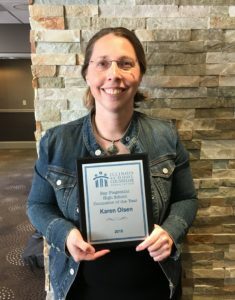 Ms. Karen Olsen actively displays educational leadership at Collinsville High School and her endeavors have certainly impacted CHS in a positive manner. From every perspective, she is an exceptional person and educator who has a positive impact on everyone around her. She elevates the staff and students at Collinsville High School to achieve things they don’t think are possible on their own. Kitschy song lyrics like “You Are the Wind Beneath My Wings” and “You Raise Me Up” totally describe what Karen does for people EVERY day. It is in her being that she works to support others. Her office has a constant flow of individuals with questions and personal problems. She patiently supports them. Everyone leaves her tiny workspace thinking they are the only person in the world and she has nothing to do but help them. I often wonder how she is able to accomplish so much with so many distractions. I often wonder how one person can be so many things to so many people. I often wonder if she knows how much she is appreciated. I could go on and on with examples of her good works. I could collect volumes from people about how she has influenced their lives. The thing about Karen Olsen is that she is extremely humble and prefers to be in the wings while others are in the spotlight. However, she deserves a moment in the spotlight. She deserves to be recognized so others can see her as a role model and an example of selflessness and professionalism. When talking to Ms. Olsen about my future, I mentioned I had an interest in interior design. Just three hours later, she had a list of schools, with a stack of printouts that were options of the area, type of school and major I was interested in. She constantly keeps in touch with my dad about college updates and is personally invested in not only my life but by brother’s (age 18, attending Indiana University – Purdue University Indianapolis in the fall) and my sister’s (age 20, attending Truman State University) lives as well. Without her, the three of us would not have all the knowledge we do about available scholarships and the things certain colleges could offer us. She is constantly checking on me and my college search and staying up to date on the schools I am interested in, so she can do whatever she can possibility do to help.